Did you hear the NEWS??!!! | Micro Daily & Protein Daily in ACTION! Did you hear the NEWS??!!! Posted on November 1, 2015 by Micro Daily & Protein Daily in ACTION! If you missed out on what was announced today, or you just want to make sure you heard right? Well we can reassure you that, you most definitely did. Christmas did come early this year with these two new announcements! 1. This promotion totals up the PGV, Personal Group Volume (volume from your personally sponsored people), new enrollees and existing members, during the month of November. 2. The following bonuses will be paid out based on your PGV total for November. a. Generate 500 PGV or greater and earn a bonus of $250 on top of your regular commissions. b. Generate 1000 PGV or greater and earn a bonus of $750 on top of your regular commissions. c. Generate 1500 PGV or greater and earn a bonus of $1500 on top of your regular commissions. 3. These bonuses do not compound meaning you can only earn one bonus based on the total enrollment volume amount you achieve. 4. The promotion period is November 1st through November 30th 2015. 5. Bonuses will be paid on December 15th. 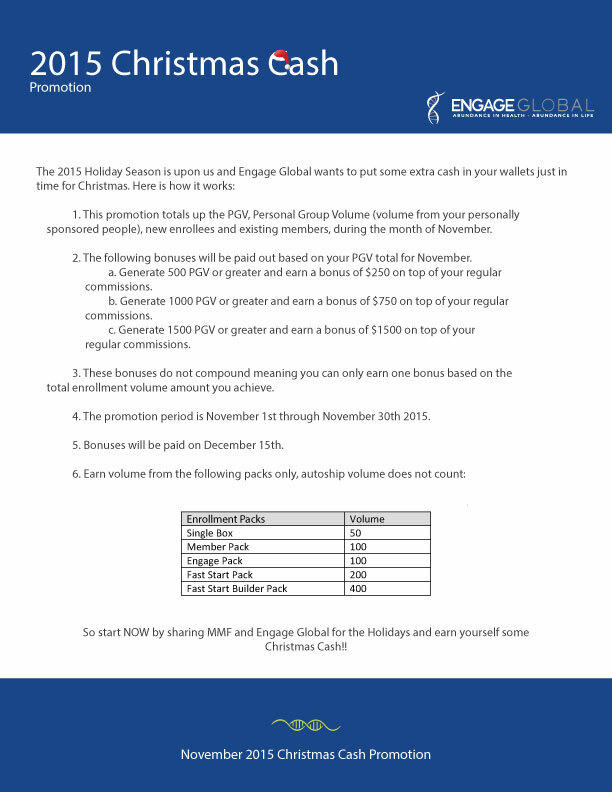 So start NOW by sharing MMF and Engage Global for the Holidays and earn yourself some Christmas Cash! !